In a medium saucepan, combine water, rice, cinnamon stick, lemon zest, salt, and freshly grated ginger. Bring to a boil. Cook over medium-high heat, until water is absorbed. Reduce heat to low. Stir in the milk, raisins, and almond extract. Serve warm. Get the latest updates and recipes. Sign up to receive our newsletter. 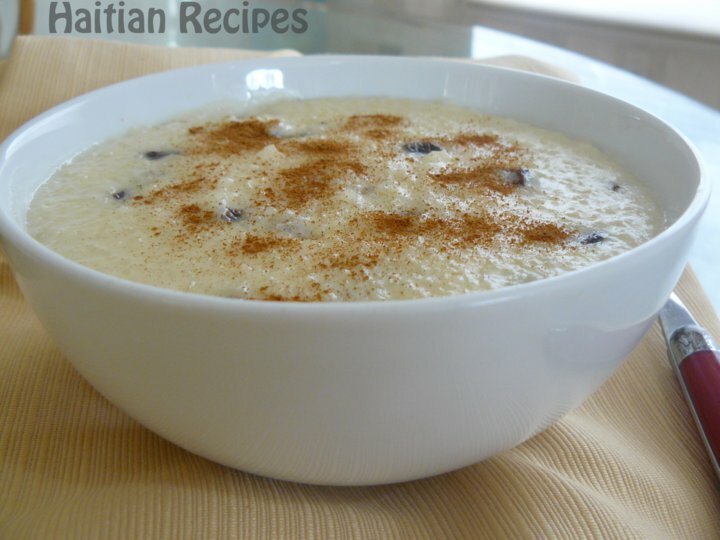 Haitian Recipes is dedicated to our rich and diverse cuisine. As Haitians, we know how great our food is. To the world, Haiti may be one of the poorest countries in the world. But to us, we are rich in our history, cuisine, and traditions. Join us on this culinary journey and share your own Haitian recipes.